Our organization offers an exclusively designed gamut of Partywear Designer Classic Sarees. These designer sarees have attractive patterns and are manufactured by making use of finest quality silk. These are prominently in the fashion. 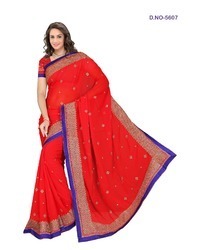 We offer wide collection of Designer Sarees in different colors, prints, and embroideries. 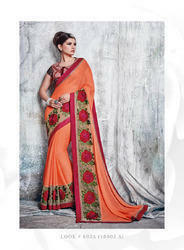 These Designer Sarees are praised due to striking designs, patterns, and embroidery work done by our team of designers. With elegant designs and royal look, the product is in demand across the market. we offer them in diverse sizes and shapes at industry competent Prices. Backed by our in depth experience of manufacturing, supplying and exporting a huge spectrum of Cocktail Party Wear Designer Sarees, we are presenting supreme range of Partywear Cocktail Designer Sarees to our prestigious customers. These are manufactured by using the highest grades of fabrics, blends, and threads as well as cutting edge technologies in our state of the art facilities. 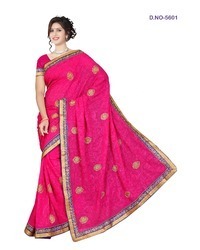 These Sarees are widely appreciated for eye catching designs, colors, patterns, and styles. We have teams of adept designers to produce sarees with amazing designs and vibrant colors. We maintain extremely stringent quality standards to offer a flawless range of these Sarees to our discerning customers. Our prestigious clients are offered a wide array of Cocktail Party Wear Designer Sarees such as Ethnic Party Wear Saree Fashion Wear Designer Saree that are unrivaled blend of rich traditions and trendy designs. We manufacture these Sarees by using the highest grades of fabrics, blends, and threads in our ultra modern manufacturing facilities. These are having intricate designs and arresting patterns. Our skilled craftsmen design these Sarees painstakingly. These are available in a wide choice of patterns, colors, as well as styles for our valued customers. We follow stringent norms of quality in compliance with well defined norms of the industry. Counting on our in depth domain knowledge and technological expertise of manufacturing, supplying and exporting a wide assortment of Cocktail Party Wear Designer Sarees, we are presenting premium range of Art Designer Decor Party Wear Sarees to our valued customers. These are manufactured by using the finest grades of fabrics, threads, and blends. We have modern manufacturing facilities where we use cutting edge technologies to manufacture these sarees. Our range is widely appreciated for arresting designs and impeccable stitching. Our dexterous designers produce these sarees with pleasing designs and dynamic patterns. We offer this immaculate range of these Sarees to our valued clients at leading industry prices. We are offering our clients, a wide variety of Designer Sarees, which is available in a plethora of colors and design patterns. These sarees are the perfect blend of ethnicity & modernity and are sure to lure the attention of fashion conscious ladies all across the nation. We are engaged in offering an entire gamut of exquisitely designed Cocktail Party Wear Designer Sarees that includes Bollywood Style Fashion Designer Partywear Sarees. These are made by using the finest grades of fabrics and are elaborately designed by our deft craftsmen. These are having vibrant color combinations and are made by using cutting edge technologies in our state of the art facilities. These Sarees are flawlessly stitched and produced by adhering to stringent quality parameters such as shrink resistance, unevenness, and foreign fibers. We also ensure seamless packing to preserve freshness and original look of these Sarees. We take pleasure to introduce ourselves as the renowned dealer, exporter and supplier of exclusively designed Digital Printed Designer Saree. Our offered sarees are available in various alluring designs and patterns. Counted as one of the reputed manufacturers and suppliers, we are involved in offering a unique collection of Velvet Designer Saree. Demands of these sarees are increasing day by day owing to excellent finish, appealing look and elegant designs. Backed by the years of experience and expertise, we are engaged in offering a wide range of Formal Designer Sarees. 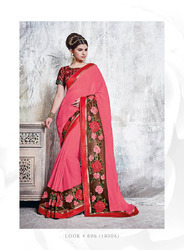 Offered sarees are easy to wash and give an elegant formal look to the personality of wearer. 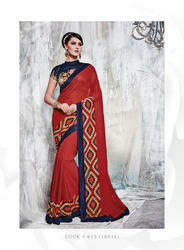 We do offer a Indian Designer Casual wear Sarees. The offered sarees are crafted with the help of finest quality chiffon and advanced machines in compliance to set industrial standards. Clients can avail from us a variety of designer party wear sarees look gorgeous and comfortable, our sarees come out in different patterns including printed, embroidered and as simple. The gorgeous saree is selected with care so that they make any lady wearing it look enchanting and adorable. our trendy designs and ethnic motifs of adoring range of sarees are perfect for party. We are engaged in offering our Clients a superior quality range of Partywear designer Sarees. Our offered saree is made available in a number of sizes, designs and patterns as per the specifications laid down by our clients. It is worn by ladies to the parties and family functions. Being the leading names in the industry, we offer our clients astonishing collection of Bhagalpuri Designer Sarees that are valued among the clients for attractive designs and smooth surface finishing. 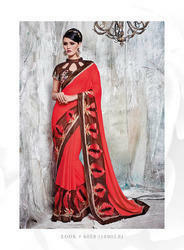 Catering to the vast market by offering attractive assortment of Designer Sarees. We are engaged in offering optimum quality Hand Embroidery Designer Work Party-Wear Sarees that is designed by our skilled craftsmen in sync with the latest fashion trends. Fabricated using high grade raw materials, these sarees are apt to be worn in all types of occasion. We hold expertise in manufacturing, supplying and exporting an exclusive collection of Party Wear Bollywood Fancy Designer Sarees. Demands of these party wear sarees are increasing day by day owing to latest designs and fine classy finish. 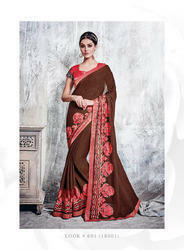 These sarees are stitched to perfection and can be manufactured as per the requirements of the clients. We are offering our clients, a wide variety of Indian Designer Sarees, which is available in a plethora of colors and design patterns. These sarees are the perfect blend of ethnicity & modernity and are sure to lure the attention of fashion conscious ladies all across the nation. We are offering our client an excellent quality range of Designer Saree.These sarees are designed as per the latest market trend using high grade fabric and other related material under the guidance of skilled professionals. The offered sarees are available in numerous patterns, shades and colors in order to meet the diverse needs of the clients. We offer these sarees at market leading prices for our valuable clients. 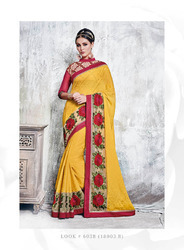 Our organization offers an exclusively designed gamut of Designer Sarees. The offered designer sarees are manufactured by making use of finest quality silk and designed with attractive patterns, that are prominently in the fashion. Looking for “Partywear Designer Classic Sarees”?